Bharti Airtel, announced the availability of its 3Ghigh speed mobile internet services in Maharashtra and Goa from 4th of August midnight onwards. Airtel has operations in 19 countries including Asia and Africa. Now, Airtel customers in Maharashtra and Goa will be able to experience the world class Airtel 3G on the move. With Airtel 3G you will be able to enjoy a host of exciting capabilities including Mobile TVWatch your favorite channels on the move!, video callsNow SEE and hear your loved ones!, live streaming of videosYouTube on the move! and social networkingFacebook, Orkut, Google+, LinkedIn, MySpace etc. on the go – all at speeds never experienced before. Airtel also offers high speed USB data cards that provide customers with 3G access on laptops. 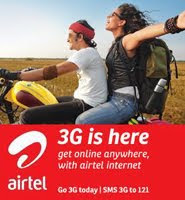 Airtel 3G services will be available in Maharashtra and Goa starting midnight on 4th August 2011. Experience 3G now, Go to Tools>Settings>Network>Select Automatic mode>Select UMTS or 3G>3G netowrk will be selected automatically. After 3G Network Selection move to DUAL mode (2G &3G). For assistance call 12134. To know more or join Airtel 3G services – customers can visit Airtel 3G or call 12134 (toll free) or SMS ‘3G’ to 121 to GO 3G now!